Although his principal photography duties are complete for "Skyfall", Daniel Craig was reportedly back at Pinewood Studios today to shoot a television commercial. 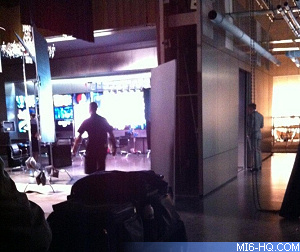 It is unconfirmed which TV commercial the James Bond star was filming, in what appears to be 007 costume, but it is assumed to be for Sony. The Twitter user who passed on the snap works for the electronics giant. The team completed work on a Heineken advert back in April.